A Gurn from Nurn: Nairn a car-dependent town? The issue of car parking played a dominant role in both the recent town centre Charrette and the Patients Participation meeting. Are we too dependent on the car in Nairn or even more dependent than some other towns of a similar size? The hospital does suffer from a lack of parking at peak periods and perhaps not enough staff and patients cycle or walk to the building as the designers might have anticipated. What was interesting was how much information some patients had about the parking situation – obviously if you have to attend the hospital on a regular basis you will become an expert on the parking situation and the ins and outs of who is perhaps parking where they shouldn’t be etc. It looks like a situation that we will all have to live with as there isn’t really anywhere for the hospital to extend its car park. Maybe the bus services could be improved but that would depend upon subsidies: there is often debate at Suburban Community Council about the pros and cons of bus services in Nairn and often the co-ordination between the hospital service and the buses running along the A96 is mentioned. In a landscape of continuing austerity it is hard to see where the Highland Council could find the cash to back extra services however. Maybe there could be some other community based services that might alleviate the situation at peak times – remember when the practice was in the process of moving to the hospital there was a bus service ran by the Rotary during that period. For the foreseeable future, however, it looks like the car will be the best way (and the first choice method) of getting to the hospital. Interesting that Brian should mention Viewfield, those attending both the sports club and the Community and Arts centre do like to park on that side of the A96 and when there are folk going to the club at the same time as a popular event is on in the centre there will be people who park on the grass verges of Viewfield, preferring to do that rather than park over in the town car parks and walk across the A96. It is normal for human beings to want to park their cars as close as possible to their destination and that will probably never change. In the town bad habits continue without the regular presence of a traffic warden to enforce parking rules in the town. The car rules in Nairn town centre and most of us turn a blind eye and sometimes dare to offend ourselves? One of the experts at the Charrette said that the parking in the town centre could be rearranged to make more spaces. How realistic is that option when the local authority is not the land owner for a large part of the parking areas behind the High Street? Will any development that comes out of the charrette really be dictated by the car and how best to accommodate it? The answer is probably yes but there is one ray of hope: it was also stated at the charrette how the Nairn travel to work rate by bicycle was 7% compared to an average of 2 to 3%. The problem for cyclists in Nairn is the A96 and the inability to navigate (legally) against the one way system. Perhaps some changes could be made to alleviate this situation. 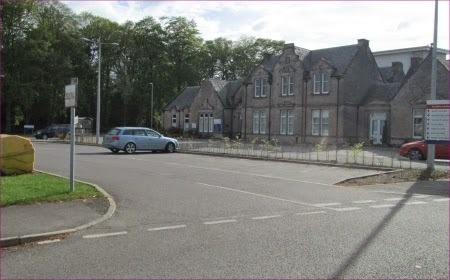 It was taken as given that there will be a Nairn bypass and this will give opportunities for changes once it happens – just a little more priority for cyclists and pedestrians perhaps? The majority in Nairn will probably always want to use cars and will continue to do so as long as it is an economically viable form of transport but perhaps with a little thought an alternative might be more attractive. I am not against the hospital staff parking at the premises as I am quite sure some staff may travel quite a distance to work. I have been there early and and it is quite amazing the amount of staff that do take up the parking provision, however that is a bad reflection on the design and provision for parking at this facility especially as the provision should have taken account of the likelyhood of increased use due to the location. I nearly always use a combination of electric bike and train to get to the hospital from the Black Isle. I can easily do home visits and school visits around Nairn by bike and it is often quicker than driving. There is space for about 20 bikes in 3 bike racks and over the summer last year they were getting pretty full. I've been pushing for more of them. Several other staff are now catching the train regularly. However the bus service is pretty poor and stops just when it's needed most. There are a lot more meetings and clinics that used to happen in Inverness which often saves travel but does mean more people in total so even though quite a few people are being 'green' there are more people to accommodate than initially planned. The parking situation will soon be fixed, when they get planning for Nairn South.! We won t be facing that road to the hospital no matter how sick we feel.